We use photo-narratives to initiate an open, personal, and holistic dialogue about life in South Side communities. Throughout the winter and spring of 2015, we reached out to students at Chicago Youth Programs (CYP) and Imagine Englewood If (IEI) and asked them to share their stories by taking photos of their daily lives and experiences. Using these photos to start a conversation about their lives and communities, we collected oral histories of South Side residents and communities. We also worked with a cohort of eight high school students from CYP and IEI. This "internship" program allowed us to work closely with the students for six weeks leading up to the exhibit. To supplement and inform this process, we invited local artists to give workshops and field trips focused on multi-media storytelling, poetry, writing, and performance. 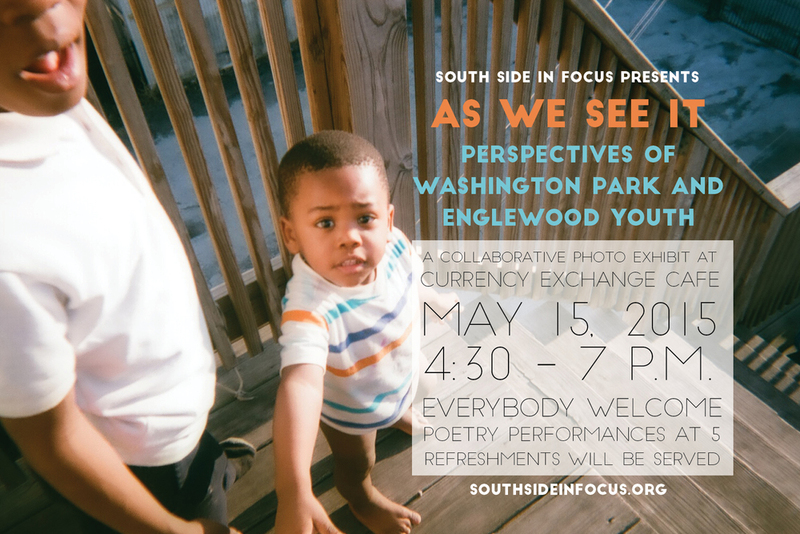 On May 15, 2015, South Side in Focus held our third event, featuring photos, oral histories, video narratives, and live poetry performances by Washington Park and Englewood youth. Located at Currency Exchange Café, near the Green Line Garfield stop, more than 100 people attended this community event. Through this exhibit, we hoped to provide a space for discussion and exploration of the broader themes of community, identity, and belonging.